A statement issued by the regulatory agency said it is sticking to its original position that that medicines that reduce bad cholesterol benefit patients at risk of heart attack, stroke, or sudden death. For the past year, many experts have instead been saying  based on results of the study of cholesterol drugs sold by Merck & Co. and Schering-Plough Corp.  that reducing cholesterol levels isn't enough to reduce those risks if there's no evidence the medicines control plaque buildup in arteries. Vytorin, a pricey combination pill, is sold by a joint venture of Merck, based in Whitehouse Station, N.J., and Schering-Plough, based in Kenilworth, N.J. It contains drugs that lower cholesterol in two different ways: Schering-Plough's Zetia, which reduces the amount of cholesterol absorbed from food, and Merck's former blockbuster Zocor, which lowers the amount of cholesterol produced by the body based on one's genes. Zocor got generic competition in June 2006, and those versions cost about one-third as much as Vytorin. "The price differential between the two products is so big that this may not make much of a difference" in sales of Vytorin and Zetia, said analyst Steve Brozak of WBB Securities. In a stronger economy, the FDA statement likely would bring a bigger boost to sales of the drugs, he said. Last January, initial results of a study called ENHANCE showed Vytorin was no better than Zocor at reducing plaque buildup in neck arteries  indicating Zetia gave no added benefit over Zocor. That led several prominent doctors to urge patients to abandon Vytorin in favor of older cholesterol drugs with a longer track record. 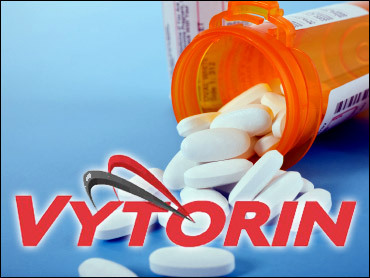 Sales of both Vytorin and Zetia began falling almost immediately as a result. On Thursday, FDA said it had completed its review of the final report on the study. The agency said results showed that after two years of treatment, even though there was no difference in the thickness of plaque in the carotid artery in patient groups that got either Vytorin or Zocor, there was a significant difference in cholesterol levels. Those in the Vytorin groups saw their level of bad, or LDL cholesterol, fall by 56 percent, versus a 39 percent drop in the Zocor group, FDA wrote in a statement. That big of a difference normally would be "a big deal," Brozak said. In its statement, the FDA wrote that, "Based on currently available data, patients should not stop taking Vytorin or other cholesterol-lowering drugs and should talk to their doctor or other health care professional if they have any questions." The drugmakers' joint venture issued a brief response repeating that statement. "We are pleased that the agency has completed its review of the ENHANCE study," the companies said.